First and most importantly, (as one can immediately tell from the title) this story doesn’t take place in some made-up exotic land, but almost literally in Vesper’s backyard. Not only is the story set in a real location, but the plot revolves around real people and events from history: the story starts with Ulysses S. Grant (“call me Sam” he tells Vesper, as presidents do when conversing with twenty-year-old women they have just met) coming to Vesper’s mansion and informing her that that dastardly villain Dr. Helvitius (cue eyerolling and muttered, “Christ, already?” from yours truly) has kidnapped the two young children of the emperor of Brazil. The reason that Grant has come to Vesper for help is because Helvitius is demanding that the ransom for the kids be delivered by Vesper herself. Because that’s a good idea. At this point, I’m starting to think that Helvitius just has a crush on Vesper and, in true rom-com style, keeps coming up with increasingly ridiculous plots just so Vesper can show up and foil them. The ransom itself involves the emperor basically handing over control of Brazil’s economy to Helvitius, and it’s reminiscent of Dr. Evil’s demand for ONE HUNDRED BILLION DOLLARS in exchange for not blowing up the world. Anyway, Vesper leaps into action with the whole Vesper Holly Gang – Brinnie, Smiler, and Slider – and a new addition to the group. His name is Tobias Passavant, his nickname is The Weed, and he has apparently been living in the Holly mansion for several months while he uses Dr. Holly’s library for his research. His introduction is about as abrupt and nonsensical as that time Dawn Summers joined the cast of Buffy the Vampire Slayer at the end of season four (as I did when I compared Vesper to Lara Croft, I’m crediting Alexander with taking inspiration from something that didn’t exist yet – this book was published in 1990, long before Buffy and the gang showed up). Anyway, The Weed is basically a human Deus Ex Machina, appearing whenever Vesper and the others are in trouble and having an unimaginably vast sphere of allies – they include sailors, hunters, a Philadelphia pretzel vendor, and President Grant. He and Vesper are obviously going to bang. The plot moves at typical Vesper Holly breakneck pace, and culminates with the gang trying to locate a bomb that Helvitius has placed at the Centennial Exposition (an event that actually happened in 1876, which the Emperor of Brazil did in fact attend). The ending is a little anticlimactic (“I found the bomb!” “Oh no!” “It’s cool, I disarmed it.” “Hooray!”) but the rest of the story moves along at an appropriately fast clip. Also my favorite character, Aunt Mary, makes a brief appearance where she outwits Helvitius, cementing her status as the most capable person in the book. I know that there’s only one more book to go in this series, but I still hold out hope that Mary will be our final narrator. There’s also a nice little Sherlock Holmes reference, where Brinnie witnesses Vesper and Helvitius grappling with each other and plunging into a river – neither one of them is dead, obviously, because like I said, we still have one more book. It’s weird to say that I liked this book so much because it was rooted in reality, because realism has never been a selling point of the Vesper Holly books. But this story is proof of the saying that the truth is stranger than fiction – the Philadelphia Centennial Exposition might not have actually been threatened by an incompetent supervillain, but all the other details Alexander provides are true, including the little detail about how the Emperor of Brazil was responsible for making sure everyone noticed the little display by an unknown man named Alexander Graham Bell. There’s a nice afterword where Lloyd Alexander explains all of his historical inspirations for the book, and it was enough to make me wish that the entire series had been like this: Vesper Holly has fantastical adventures in real cities while sneakily teaching kids about awesome real stories from history. But since the final book in the Vesper Holly series is called The Xanadu Adventure, I doubt that this is the direction Alexander will take things. 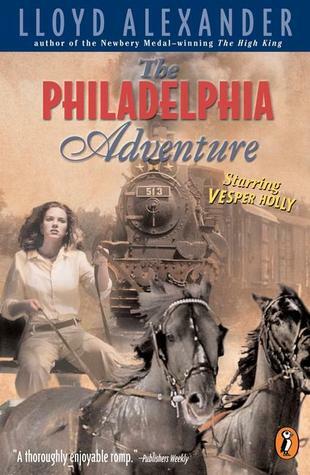 It’s not a typical Vesper Holly story, but The Philadelphia Adventure is a fun little digression from the usual formula. Appreciating a Vesper Holly adventure because it’s rooted in reality is not something I would have expected, but Vesper has always been able to surprise me.